Publicity shot. 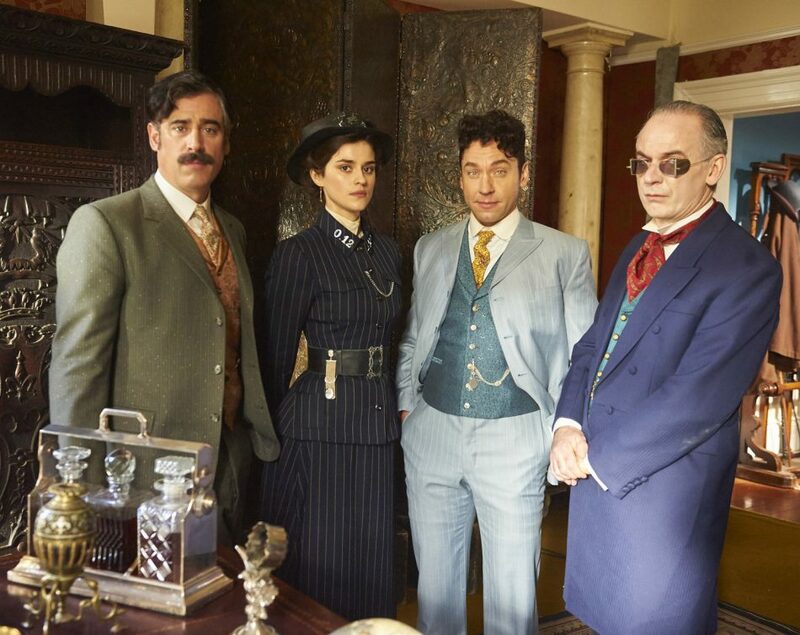 Arthur Conan Doyle (Stephen Mangan), Adelaide Stratton (Rebecca Liddiard), Harry Houdini (Michael Weston) and Bram Stoker (Paul Ritter) feature in “Strigoi,” an episode of Houdini & Doyle. Picture: FOX Broadcasting Co; http://scifi-tv.ru/. In case you haven’t watched it, the series takes place in the late 1800s in London. Famed writer Arthur Conan Doyle (Stephan Mangan) and magician Harry Houdini (Michael Weston) pair up with a young female detective at the New Scotland Yard, Adelaide Stratton (Rebecca Liddiard), to solve paranormal related cases that the Metropolitan Police can’t solve. This episode introduced Bram Stoker (Paul Ritter) as a long-time friend of Doyle’s. Stoker turned up at Doyle’s house in a flustered state, claiming vampire hunters were trying to kill him, but offed his maid instead. Stoker and Doyle speculated that crazed fans were responsible, not vampire hunters, since Stoker’s book, Dracula, would be released the following week. While they spoke about the incident, Doyle picked up a photograph on his desk, which confirmed their friendship as he recalled the date it was taken. That left me wondering: were Arthur Conan Doyle (1859–1930) and Bram Stoker (1847–1912) friends in real life or was the show just mincing in little tidbits of history that worked with their plot line? Abraham “Bram” Stoker (8 november 1847 – 20 april 1912) was an Irish writer wellknown for his novel Dracula. He was a friend of Sir Arthur Conan Doyle. He was at his marriage on 18 September 1907. In that same year he conducted and wrote an interview with Conan Doyle: Sir Arthur Conan Doyle Tells of His Career and Work, His Sentiments Towards America, and His Approaching Marriage. I managed to track down a copy of Stoker’s interview with Doyle, via bramstoker.org. The interview was first published in The World (New York) (July 28, 1907). 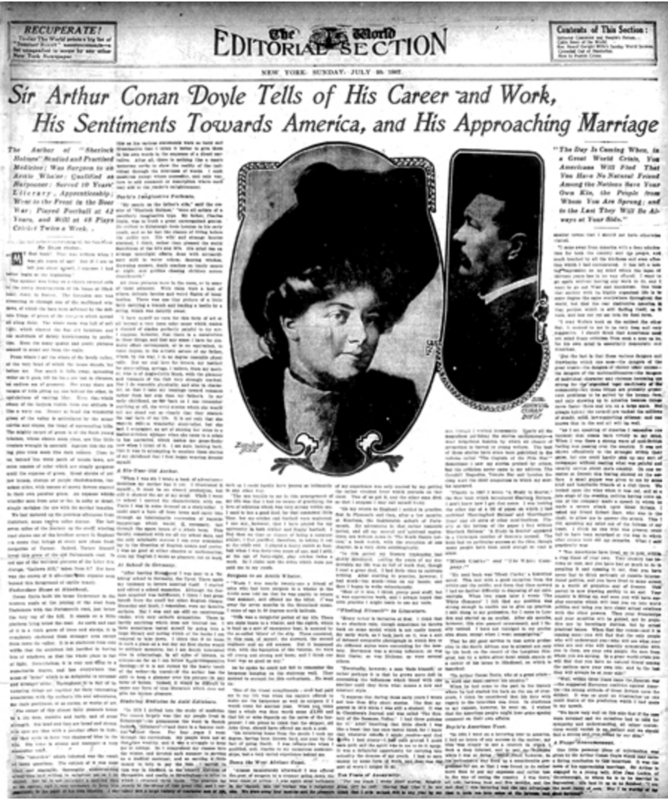 A thorough look at Doyle: “Sir Arthur Conan Doyle Tells of His Career and Work, His Sentiments Towards America, and His Approaching Marriage,” an interview Bram Stoker conducted with Arthur Conan Doyle, published in The World (New York) (July 28, 1907). Picture: bramstoker.org. Excerpts from the interview were published in at least twenty other publications before the whole interview was reprinted by The Daily Chronicle (London) (February 14, 1908). 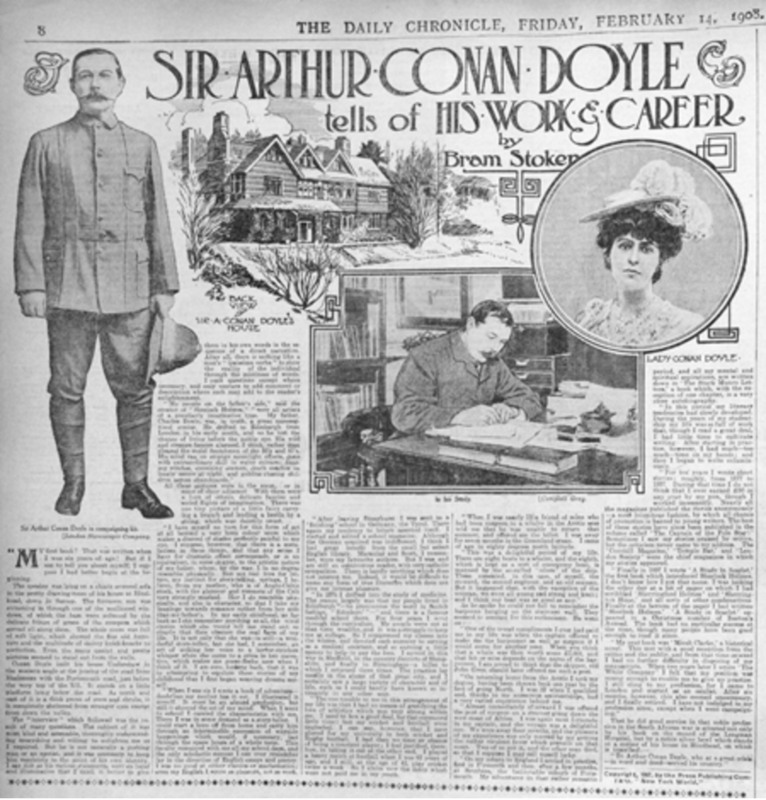 Eight months later it made it to England: The interview, retitled “Sir Arthur Conan Doyle Tells of His Work & Career,” was later published in The Daily Chronicle (London) (February 14, 1908). Picture: bramstoker.org. 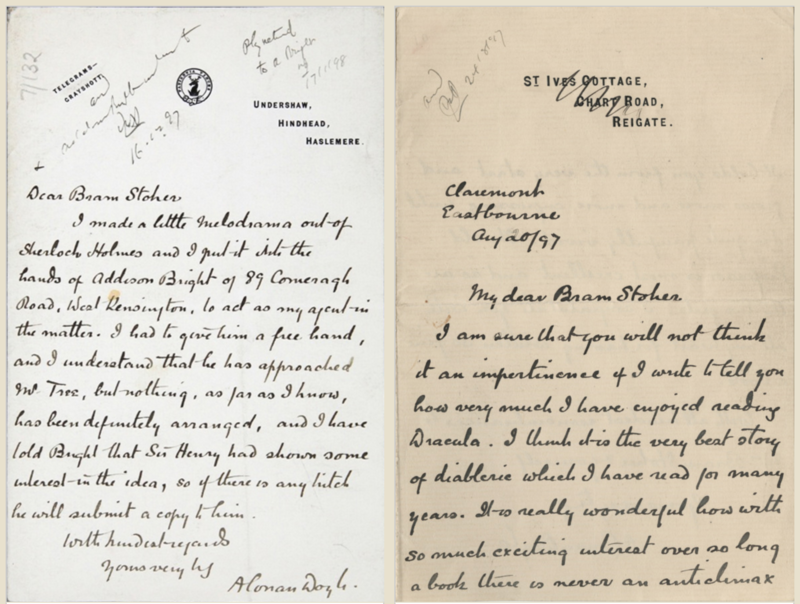 The site that hosted these interviews even features copies of correspondence between the Stoker and Doyle. Notice one letter has Doyle praising Stoker’s Dracula. Looks like Doyle was a fan of vampires and not just detective work. Doyle’s letters to Stoker: Left, undetermined date. Right, August 1897. In the letter, Doyle told Stoker that Dracula is “the very best story of diablerie which I have read for many years.” Picture: The Sir Arthur Conan Doyle Encyclopedia. The Sir Arthur Conan Doyle Encyclopedia: “Bram Stoker,” The Sir Arthur Conan Doyle Encyclopedia, last modified Feb. 6, 2016 at 02:16, accessed August 8, 2016, https://www.arthur-conan-doyle.com/index.php?title=Bram_Stoker. archive.is link: http://archive.is/8nF10. I managed to track down a copy of Stoker’s interview with Doyle: [Paul S. McAlduff], “Sir Arthur Conan Doyle,” Bram Stoker, n.d., accessed August 8, 2016, http://www.bramstoker.org/nonfic/doyle.html. archive.is link: http://archive.is/6qdV0. “When Bram Stoker managed The Lyceum Theatre in London”: “Bram Stoker,” The Arthur Conan Doyle Encyclopedia. You can download copies of Stoker’s original interviews with Doyle in 1907 here and 1908 here. “Houdini & Doyle,” the TV show which inspired this article, will not be renewed for a second series. Its final episode screened on July 4, 2016 (May 12, 2016 in the UK).